I took on a very different kind of work and had a blast! 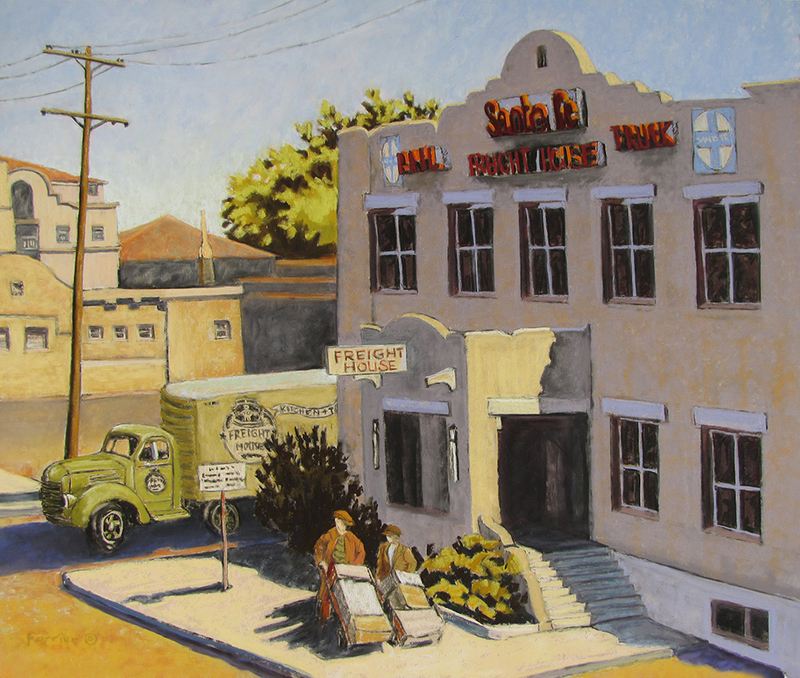 Matt DiGregory, the owner of the new Freight House Kitchen and Tap, was looking for a historic painting of the name sake for his new restaurant in Bernalillo, NM. This piece was done with strong historic references and field studies of different types. I started with on site studies of the actually building in Albuquerque. It is a charming building that is listed on the historic building registry. Although it is standing in it's original state, much has been built up around it and it is empty with plywood windows, giving it little life. After doing a number of sketches and color studies I took photographs from different angles and headed to the Albuquerque Museum of Art to meet with Glenn Fye, photo archivist. He was super helpful and interesting. There were not many images of the specific building, but I got to see a lot of period activity in the area, which helped immensely in giving me a vision for the piece. When I returned home I worked up a number of 'layout' ideas that were small and casual. I was looking for a composition and historic context while doing these sketches. I realized at that point that my weak link was going to be in drawing the trucks that may be coming and going from the freight house which was, of course, a huge part of the original use... back to field studies! I spent a couple of weeks seeking out old trucks that could fit the time period - especially ones that had a hill nearby that I could climb to get the right angle. My husband joined in and we made it a vacation project. I have a whole new perspective and respect for older trucks now! After gathering more confidence in my vehicle sketching, I did the layout above on sanded paper. This would be my underpainting for the pastel. Clearly, this is the time to get your composition in order and make any changes that you are going to make. Now the fun begins! COLOR! I tried to stay true to the historic presence while making a pleasing image. My focus, as always, was on the light and shadow relationship. It was a very fun part of the process for me. Upon arrival to the opening of the Freight House Kitchen and Tap, I was thrilled with the placement and lighting of the pastel... not to mention the food and beer! All around, it was a very fun experience!